Your Face. It has been with you through it all and been shaped by your experiences. It is a highway of the senses, collecting and procesing information from each moment of your life. It has seen the beauty and the ugliness, it has recoiled at a bad smell, it has lit up when you heard your favourite song, and it's tasted the flavour of a delicious fruit and delighted in the touch of your first kiss. Over time our thoughts, belief and attitudes are etched in our face and shape and create certain characteristics which can be observed here. Therefore we shouldn't be surprised at how much detailed information you can get from knowing how to read a face. In fact we already do! We are consciously and unconsciously reading each others faces each day and we have a memory bank which we draw upon to tell us what certain actions, expression and features mean. What we think and feel affects the appearance of the face. When we see someone with eyes that appear downwardly slopped and the mouth is angled down, we can sense that person is experiencing sadness. If someone is talking to us and blinking a lot and unable to maintain eye contact we can sense that the person is feeling uncomfortable and perhaps not being honest. In Psychosomatics, which is to analyse both the Body and Mind of a person means its important we view the person as a whole. This is one of the reasons that attracted me to Psychosomatic Therapy because it takes into account not just the Body, Mind or Soul but the combination of it all, hence my business name ;). It is also key to notice that differences from left and right. The Right side of your face is known as the Masculine side and refers to your external world. So this will reflect how you are as an outward expression and indicate how you act and operate in business/work. The Left side of your face is known as the Feminine and refers to your internal world. This will reflect your personal side and indicate our inner thoughts and feelings. It is vitally important in a face reading that you look at both sides of the face because if you only focus on one side you will completly miss important aspect of the person. i am always so fascinated when we look at this aspect more closely. Here is an example of how different one might look if each side was symmetrical and how this changes the person. On the right side (masculine stitched together ) the most prominent feature is the eye, where as this changed quite a lot on the left side (feminine stitched together) where the nose is the most prominent feature. There is so much information that can identified in each feature of the face. Below i have included an example excerpt from a face reading i did recently. 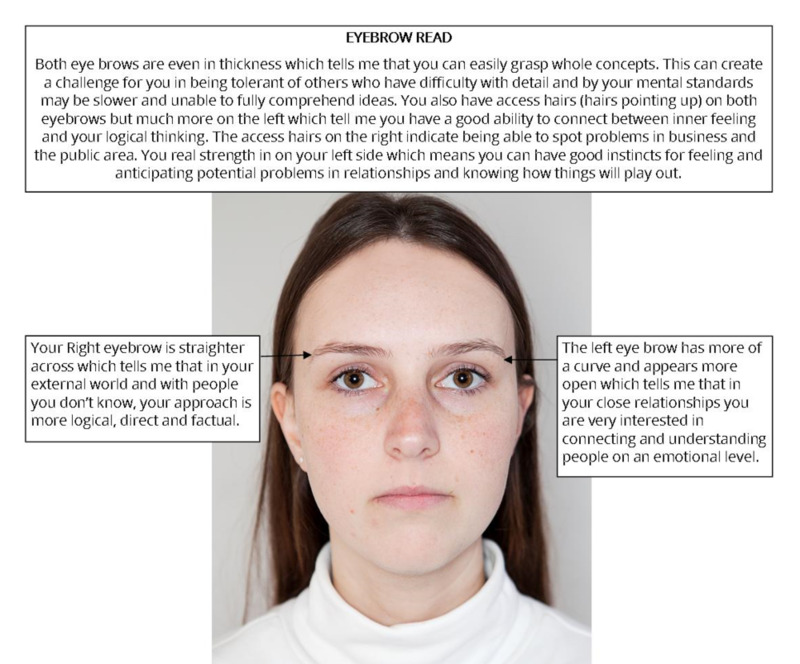 This can give you an insight in to how much information something simple like your eyebrows can say about how you think and operate. So what does your face say about you? Doing an in-depth face reading gives an overall picture of the individuals characteristics, emotional traits and the presentation of the tangible facts that creates your story. Having your face read is a great experience as it acknowledges who you are in a beautiful way. It can help you to gain better understanding of yourself and give you valuable insight into why you may do the things you do, react a certain way or tell you what makes you great at some things and why other may find others challenging . It is all written on your amazing face. This is available WORLDWIDE as it is all done via correspondence. You are require to supply the following photos:- i recommend you get someone to take the photos for you for the best natural results. Amazing Face Reading , Mac Fulfer, J.D.